The Flagler County Commission this evening is expected to sign a 40-year lease agreement—including two five-year renewals—with Aveo Engineering for land the technology company will occupy at the Flagler County Airport. The buildings that will go up on that land will revert to county ownership after 40 years. Aveo and government officials, including Gov. 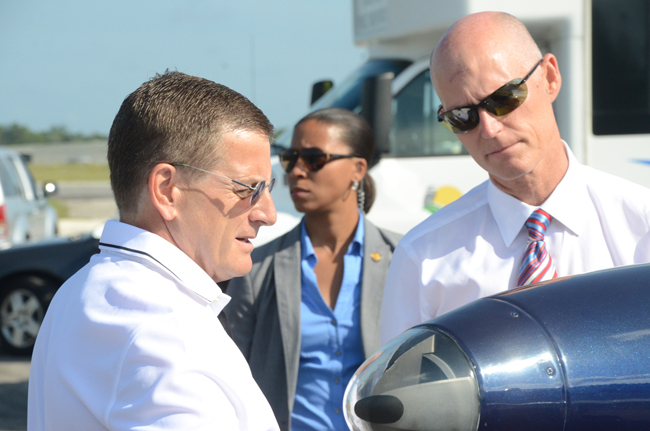 Rick Scott, broke ground on July 30 on what will be the first of two structures on airport land—a hangar with an office annex on about one acre. The hangar will be used to fit planes with the company’s LED lights, which it manufactures at a 163,000 square foot facility in Slovakia. Aveo said it would hire 50 people this year in Flagler County, and 300 people by 2016. The company plans to build a second, larger building on up to 10 acres, south of the hangar. Christian Nielsen, the company’s CEO, will brief the Flagler County Commission at the commission meeting tonight on Aveo’s broader plans. Aveo will pay the county $1,089 a month per acre, starting only when the county issues the company a certificate of occupancy for the building Aveo will build. Lease costs will be adjusted every year on Oct. 1 in accordance with inflation. Those dollars are not part of the planned $7.5 million in Aveo’s capital investments at the airport over the next several years. At the time of the ground-breaking, County Administrator Craig Coffey said Aveo could face a smaller leasing charge for the land until occupancy, but that the county might waive that fee—as it has: the lease includes no required fees ahead of occupancy. It will be Aveo’s responsibility to build improvements such as access to the land, parking, stormwater drainage, retention ponds, and all utility, communications and sanitation needs. Aveo will pay all applicable taxes, and will also be responsible for maintenance of the property—or pay the county for any maintenance the county will carry out by default, of Aveo happens to neglect any of its responsibilities. Engineering site plans are due to be turned in to the county by March. Construction must begin on the land by next September, and be completed by March 2015. All construction and improvements are to follow the county’s land and building regulations. If those terms are not followed, the county reserves the right to end the lease. The county, for its part, will complete construction—all at public expense—of the 1.4-mile south entrance to the airport grounds, off of Belle Terre Parkway. The road is used for access to the airport’s air traffic control tower. The county won’t issue a certificate of occupancy to Aveo until that road is completed. Christian Nielsen, owner of Aveo Engineering, said in July that he intended to make the Flagler County Airport facility the hub of his operation, which includes—aside from the Slovakian manufacturing plant— a 15,000-square-foot engineering center in Malaysia, a distribution office in Birmingham (Britain’s, not Alabama’s), and a programming office in Mumbai. He said the Flagler operation will eventually include a plant to manufacture the company’s signature lights, but that he had supply contracts to fulfill, from Flagler, beginning on Oct. 1. The company has also been renting space on Hargrove Grade. Van Eckert spoke with Nielsen recently about the quality of local hires. “He made a point to say to me that they’re having a great success in the interviewing process, the candidates they’re hiring are qualified and looking really good for their long-term needs,” van Eckert said. The company is associated with several well-known aircraft manufacturers, including Sikorsky, Gulfstream, General Atomics, Hughes MD Helicopters, Boeing, Lockheed Martin, and Raytheon, so its investment in Flagler may be founded on a more solid future than several previous and ill-fated arrangements between the county and private companies at the airport.